This is a super post in collaboration with Ju-Ju-Be for babies 1st birthday for all of you diaper bag lovers this will be a favorite for you for the month of April. I am a serious diaperbag love and I have recently found Ju-Ju-Be. They have all different types of diapers bags in prints and sizes. I have a video on youtube on my BFF bag and everything I can fit it in. Today I am sharing with you my Be Prepared bag in the TOKIDOKI line and the print is Fairytella and it retails for $188.00. Here she is and she is so beautiful! Now the back side of the bag. This bag comes with shoulder handles and a body strap. The straps are also in the Fairytella print. This bag is so cute that my husband doesn't even mind carrying it. I do have 1 baby and we cloth diaper so this bag has plenty of room. I use this when I am planning to be gone most of the day. There are so many pockets and places to put things the space never gets fully used up for us. Here is the inside but it is not fully packed this is a left over from switching to my other bag. First is the mommy pocket. Look at all of those pockets! I love having so much space and being able to stay organized. The next pocket is right behind the mommy pocket. You can also use this one to put the shoulder handle inside when using the body strap. I also use this for my coupons. The inside has sooo many pockets and space for all of your need no matter if you have 1 baby or 2. The inner color is so amazing and a beautiful red. In the video below you will really be able to see the full stuffing affect that this diaper bag will really hold. Behind this inside is another pocket that I keep the changing pad inside and also the other strap. Also on each side is a magnetic pouch that you can keep your bottles or sippy cups inside. Here is my Video on how I pack my Be Prepared JuJuBe bag. 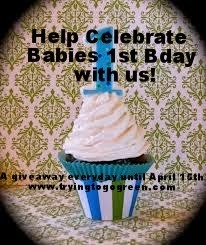 If you already didn't love JuJuBe enough they are our first sponsor of Babies 1st Birthday Giveaway! One TTGG follower will be winning a Be Prepared Diaper Bag in any in stock print!!! I really like the BE PREPARED - SHADOW WALTZ but my choice may change when we find out what we're having! I have heard so many good things about these bags! I like the Animalini print in the Be Prepared! I love the Scarlet Petals print. Such a tough decision. I love the shadow waltz with the pink! I have a boy so I worry it would be too girly but then again, I am the one carrying the bag. lol. Love any of the Legacy prints!! Is ths print called tokidoki? Licorice twirl! I WANT LICORICE TWIRL!!!!! I would love a duchess legacy! The names are not coming up, i like the black and red one. I would love to have a Duchess BP. Such a classic print. Hard to decide, but Royal Envy is one of my favorites! Shared your giveaway on FB today! So many cute prints! I really like the Licorice Twirl. I NEED a Be Prepared in Shadow Waltz! Awesome video by the way! I would love the platinum petals! I like the first lady! I love the Royal Envy print!! I love the silver ice print! I love Tokidoki print, so cute, thank you for the chance. THIS BAG WOULD BE A LIFE SAVER !! THE PRINT I ILOVE IS THE FIRST LADY PRINT :) ! This is such a cool design! I love the old Stargyle print, too. I need a JJB, I am having twins in August so I will have three kids under three! I love the Royal Envy print! I shared on Facebook again! i would pick charcol roses thanks! I love love love jujube!!! I love Silver Ice! So cute and would go with anything!